The WC Series Wireless Intercom Door Station stands only 5.8 inches tall and 2.75 inches wide, adding a modern, secure touch to any entrance. A speaker for two-way voice communication and keycode password entry are only two of the many features offered by this wireless access control entry device. The WC Series Wireless Intercom System is a multifunctional security gadget that outsmarts even our toughest competitors. The main functions are: duplex intercom, password unlock, remote unlock, multiple handset connection, LCD screen display, long range connectivity and more. This wireless Intercom System provides secure, access control entry to any home or business! Easy installation with no wiring! 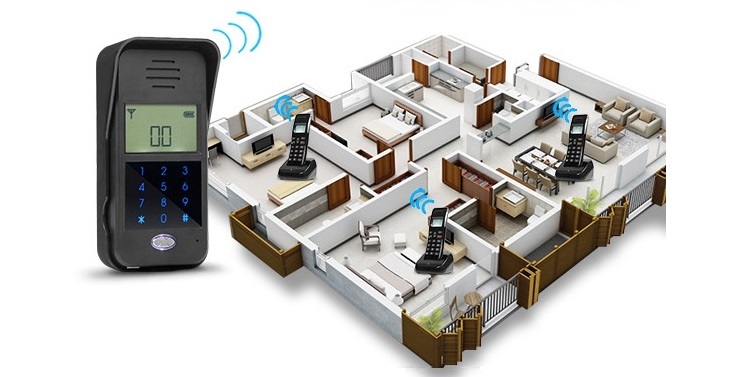 One WC Series Wireless Intercom System Door Station can connect with as many as 99 indoor handsets to create a well-connect home or office setting. Know who is requesting entry by answer the handset while in your bedroom, living room, kitchen, etc. Use the system internally to place calls from one handset to another, staying well connected throughout the home or office. The WC Series Wireless Intercom System offers high penetration, strong signals to ensure connection to even the farthest located handset. The system spans a range of up to 1,300 feet in ideal conditions. If you're prone to losing your keys or forgetting them at work, easily enter without them using the keypad code on the wireless Intercom door station. Allow employees to enter using a secure access code or grant access from inside using a wireless handset. Homes and offices with a secure access control system are safer for all who are on the property. Place a handset in each room or spread them abroad the home or office sparingly with their portable functionality. Just be sure to return the handsets to their charging bases to keep them fully charged and ready for a visotor call. Order your Wireless Intercom system today and we will ship it directly to your home or office. The WC Series is in stock now, and ships fast from New York, USA. Don't wait - get yours while supplies last! 1. The outdoor station requires (4 x) AAA 1.5V batteries (included). By employing the latest battery saving technology, standby duration can last to over a year! 2. The max supported number of handsets is 99, with a unobstructed range of up to 400m. 3. Select Ringtones and Adjust Volume — Press any key to awake screen, then press Left/Right keys to change the tone. While playing, press Up/Down to change Volume. 1. Unlock by Handset — After a call is answered, press handset’s “unlock” key to unlock the door; both handset and outdoor unit will show an unlock symbol. 2. Initial Unlock Outdoor Password — Touch keypad to wake unit, press “*” and unit will show “- - - - - -”. Input “999999”, press “#” and “R” shows on the left. Enter a new password and press “#” to confirm. This is now the default password. 3. Outdoor Unit’s Unlock Operation—Touch Keypad to awake screen, press “*”, input the password and press “#”. If correct, door will unlock. The outdoor unit also has a hidden “Anti-Peeping” function, if the password is “123456” for example, the user can enter in “xxx123456xxxx” and the door will still open. 2. Pairing among Handsets — You may add an additional handset by using one that has already been paired with the outdoor station. Using any paired handset, press any number at the keypad other than 1 (this will be the new handsets ID). Long press the left key and “Pair” appears at the top of the display. Long press “left” at the new handset to pair. “Pair” will appear and quickly disappear if successful. Press the “left” key at the original handset to end signal transmission. 3. Pairing Multiple Outdoor Units — Press the pairing key on the back of the additional door station to enter pairing mode. Press any number but 1 on the handset to pair, then long press “left” to enter pairing mode. Handset will beep, and the outdoor screen will turn off. Pairing is complete. There are no children categories of Wireless Intercom Systems.